Tag Archives: healthy meals your kids will eat! It’s been a while since I’ve posted a dinner recipe. Summer got me off track and now I’m in warp speed with school activities and soccer practices. It’s hard to get motivated to cook a meal that requires sautéing or the use of multiple pots and dishes when your after-meal activities involve baths, homework and bedtime book reading—all within an hours time. After my boys go to bed, I’m desperate for 30 minutes to myself—not an hour of clean-up in the kitchen. Last night I was faced with the reality of putting together a healthy meal in about 20 minutes. Two nights a week, my oldest has soccer practice and by the time we all return, my three-year-old will instantly start climbing the pantry, trying to grab any snacks he can reach. Yesterday I had planned to bake a chicken and accompany it with grilled veggies, but the evening got away from us and by the time we got back home, I didn’t have the time to bake a whole chicken—but why not the grilled veggies? 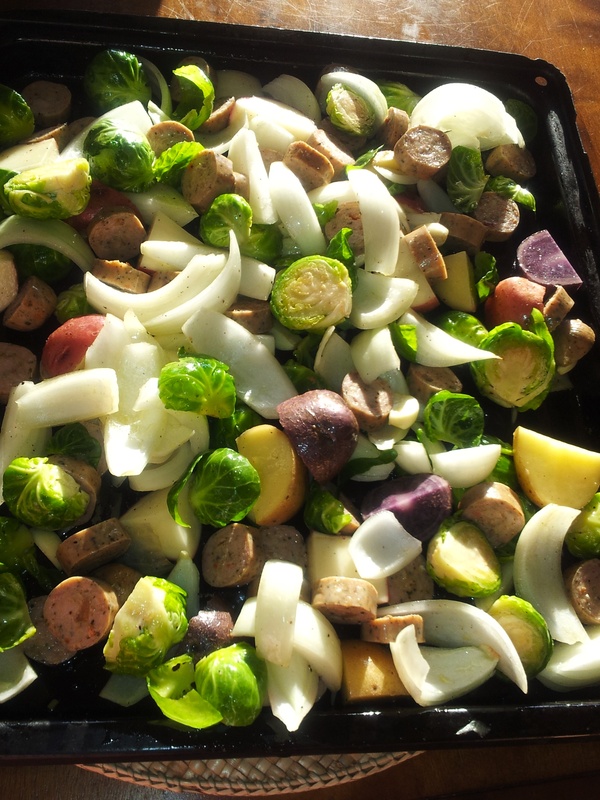 And, since I had pre-cooked chicken sausages from Trader Joes in the fridge, I realized I could put together a complete meal in one pan, with little clean up. 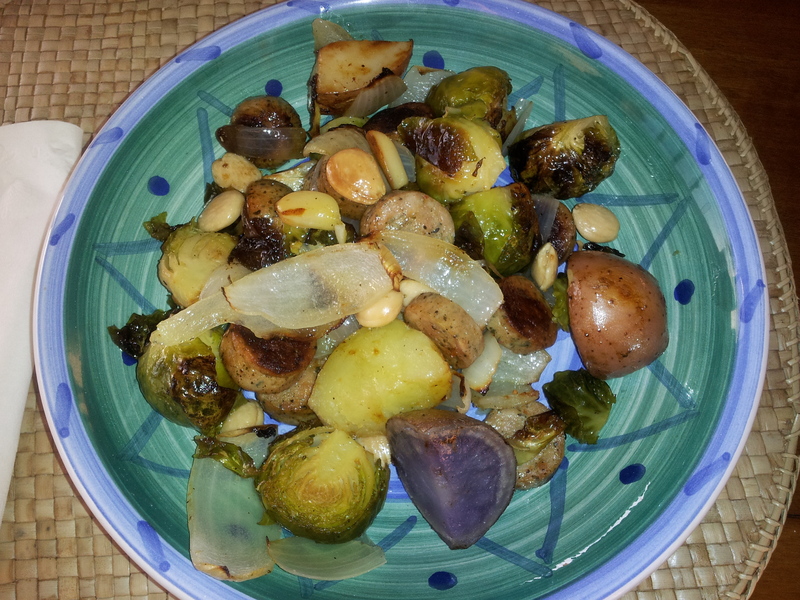 If you’re a fan of Jamie Oliver, (the naked chef), like I am—this meal is very similar to his side dishes for winter roasts. So who says you can’t make side dishes the main attraction? And, you know what? My boys ate it up! Even the brussel sprouts. There’s something about roasted garlic and onions with a touch of salt that makes everything yummy. I hope you enjoy this last-minute creation as much as we did! 6 cloves of garlic, sliced. – Serve in bowls and enjoy! This week has been INSANE!! Trying to cook healthy meals for my little ones has been an incredible juggling act between all of my kid’s activities, my oldest son’s tests and homework projects and my just-turned 3-year-olds hunger and temper tantrums. Let me back up. I think many cook books, magazines, food shows, etc. forget to cater to the reality of today’s frazzled single mom—who on some nights, has literally only minutes to get a meal on the table. On nights with extra-curriculars, I have a finite amount of time to feed my kiddos, sometimes only 15 minutes. Any excess chopping needs, can throw me off due to the crazed demands of my toddler who behaves like a terrorist at dinner time. My three-year-old must eat by 6/6:30 or he will nosh his way through my cooking time and then not eat the healthy, nutritious meal I worked so hard to prepare. He literally climbs the shelves in my pantry (that won’t lock! ), grabbing crackers, chips or breakfast bars, and has temper tantrums when I say no—delaying my meal prep even more. So when I’m rushing home from soccer practice at 6:15 this past Tuesday, I started to panic. The coach went over and I didn’t get home with my two little guys until 6:30. I was desperate to have them eat a healthy meal and not succumb to the ease of pizza delivery or a fast food drive through —especially after my youngest’s bday party on Monday! So with that in mind, I quickly put baby carrots and apple slices around some hummus for the boys to snack on, popped in a Fireman Sam DVD, and raced to put together a meal in 15 minutes. I have to say, it was an amazing success! Both boys ate all of it, and my oldest even said he’d like it again. I’m thrilled that I found another quick, yummy meal that gives my boys: Omegas, calcium and protein from the salmon as well as vitamins K, C, A & Bs from the snap peas. 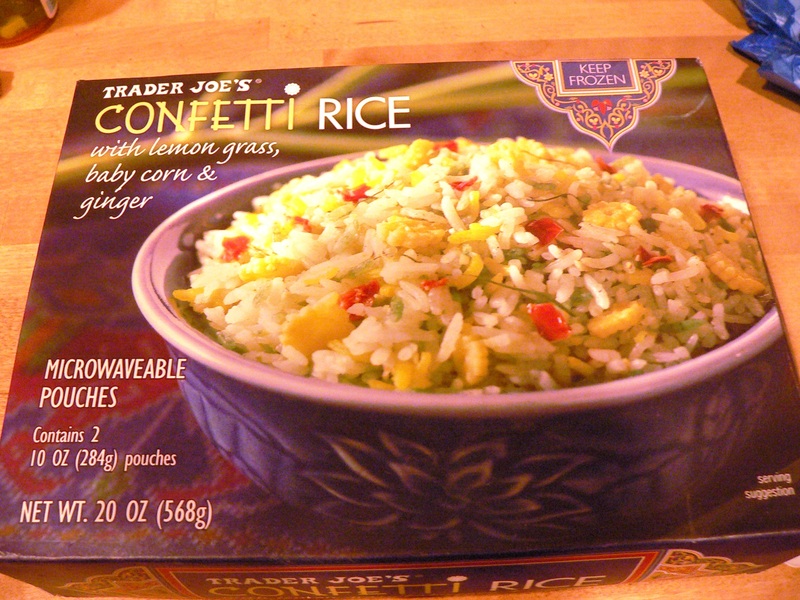 And the confetti rice, with ginger, baby corn and lemon grass, is scrumptious. 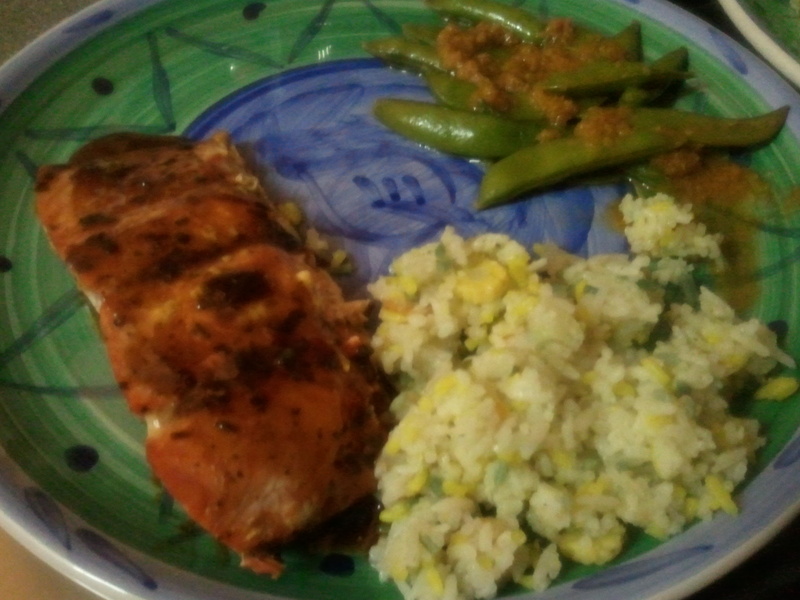 Gyoza sauce, wild salmon sockeye fillets I bought on Sunday for $8.99 a pound, frozen confetti rice, a bag of snap peas and ginger dressing. 2. Place 2 – 3 salmon fillets in a glass baking dish and pour TJ’s Gyozo sauce on top and place in oven. Cook for 10 – 15 minutes, depending on thickness of fillets. 3. Steam TJ’s snap peas 5 – 7 minutes, then transfer to small bowl. 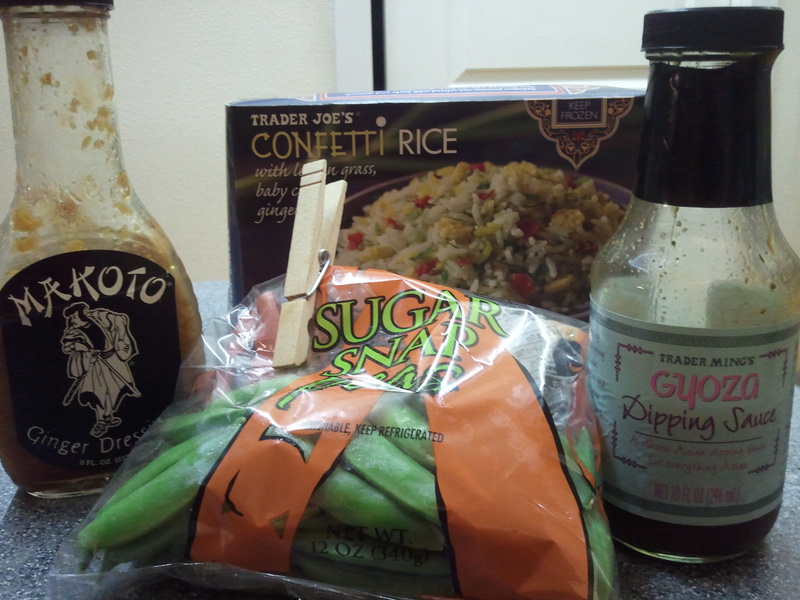 Stir in 2 tablespoons of TJ’s ginger sauce if desired.